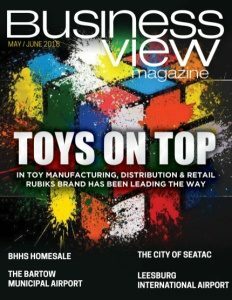 Business Magazine interviews Hayley Woodward, Head of Marketing for Rubik’s Brand Limited, as part of our focus on the toy and game sector. The Rubik’s Cube is an iconic toy that’s been around nearly as long as anyone can remember, but most people don’t know that it was never intended to be a toy. The Magic Cube, as it was originally dubbed, was invented in 1974 by Ernõ Rubik. This professor from Budapest had designed the Cube as a model to help explain 3-dimensional geometry. After its invention, it took Rubik nearly a month to solve his own puzzle. “It was a code I myself had invented, yet I could not read it,” he once wrote. It wasn’t until the 1979 Nuremberg Toy Fair that the world got its first look at the Rubik’s Cube. There, in a little back corner of the fair, the Magic Cube was spotted by Tom Kremer, then the CEO of Seven Towns, Ltd., a small toy company he had started in 1964. He negotiated with Rubik for the rights to the Cube and licensed it to the Ideal Toy Co. in 1980. The Cube was an instant success, selling 100 million units in the first three years, and holding the distinction of being the first puzzle ever advertised on television. Unfortunately, the Rubik’s Cube, as it was marketed, was just as quickly forgotten. Warehouses were full of unsold Cubes, and no one wanted anything to do with them. Tom used the disinterest in the design to his advantage, and reacquired the rights to the Rubik’s Cube, re-launching in 1991. While it didn’t regain its initial popularity, the Rubik’s Cube continued to sell well throughout the 1990s and 2000s. 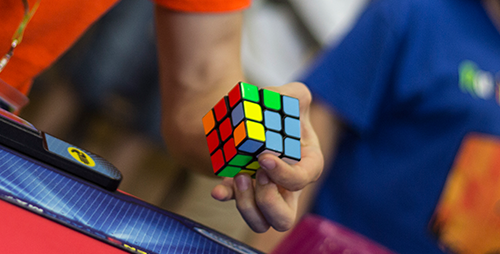 Over time, the Cube’s popularity started to grow once again thanks to the growing trend of speedcubing, or solving a Rubik’s Cube as quickly as possible. Unfortunately, because of this resurgence – and, perhaps inevitably – a growing number of fakes were being marketed as alternatives to the brand. 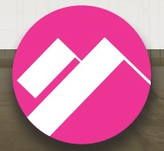 The company is relatively small, made up of CEO Mike Townend, Woodward, and Chrissy Truslow, who is the company’s legal and licensing liaison. Two other employees look after social media and the company’s web account. Professor Ernõ Rubik is Honorary Life President. 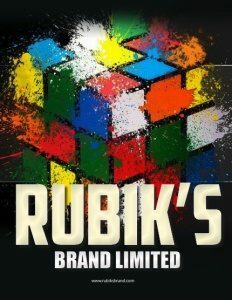 What’s Rubik’s Brand Limited up to lately? The company is expanding into licensing – turning the Cube into a brand rather than just focusing on building toys. “We have expanded quite recently into licensing and we’re really trying to push Rubik’s as a brand rather than focusing on the core product and the toy range. So, we’ve moved onboard with the Smiley Company and we’ve partnered with them to leverage all our licensing products.” They’ve signed up a lot of licensees in apparel and back to school wear, home wear, everything you can think of, Rubik’s licensing-wise.” And according to Woodward, that will be a big focus for their company for the next three to five years. In addition to licensing the Rubik’s Cube as a brand, the company is in charge of maintaining relationships with licensees and distributors around the world. Hasbro is the biggest licensee that the company deals with, handling distribution in the United States, but it is not the only company that Rubik’s Brand Limited works with to get its product out into the world. “We actually have two U.S. licensees – Hasbro, who distributes to the big chains, and Winning Moves, who distributes to the specialty toy market,” Woodward explains. In addition, the company has over 30 licensees in different territories, worldwide. The company also doesn’t change licensees often. Most of the companies that are licensed to distribute these toys have been with the company since the Rubik’s Cube was first launched. Since its launch in the 1980s, Woodward says that they’ve sold more than 450 million Rubik’s Cubes, and it is estimated that an amazing one in seven people have played with this fascinating and frustrating puzzle. And the upward trend is continuing to carry this classic toy that has delighted and infuriated both children and adults for more than 40 years, to even newer and greater heights. Check out this handpicked feature on Keller Williams Realty Metropolitan – A philosophy for growth.